The creation of Barangay Sta. Cruz dates back in the year 1969 when this small village was still a component to Barangay Casica. The villagers clamored for self-government and wanted to have a separate barangay. Through the efforts of old folks, they prepared all the pertinent papers and transmitted it to their indispensable leader Julian Bernido, who eventually became their first barangay captain. The late Bernido was determined to pass all the necessary requirements and enlisted the support of the local officials to make a resolution to declare their place a new barangay. Some people cracked under questioning and plunged him, but it didn’t deter him to win the “yes” of the local officials as long as he can confide his people. To wrap up the whole thing up, Barangay Sta. Cruz officially declared and registered as one of the 16 barangays of Anda. However, there are other conflicting versions as to how this barangay got its name. Some of it refers to the strong and rustic devotion of the people to Sta. Cruz. They firmly believed that in times of different predicaments that come their way, they can overcome all of these with the help of their strong faith. Presently, Barangay Sta. Cruz is situated 2.5 kilometers away from Barangay Poblacion. It has a total land area of 1.79 sq. meters. Majority of the people are engaged in farming with a huge stretch of irrigated rice fields. Barangay Sta. Cruz is generally a peaceful place which generally makes it a retirement haven for Balik Andahanons. STA. CRUZ RICE FIELDS – Barangay Sta. Cruz can be considered as one of the major rice producers in town. Considering the vast land area with an adequate water supply from spring, it also provides a wondrous sight especially during growing season plus the enticing scenery of the sunset. 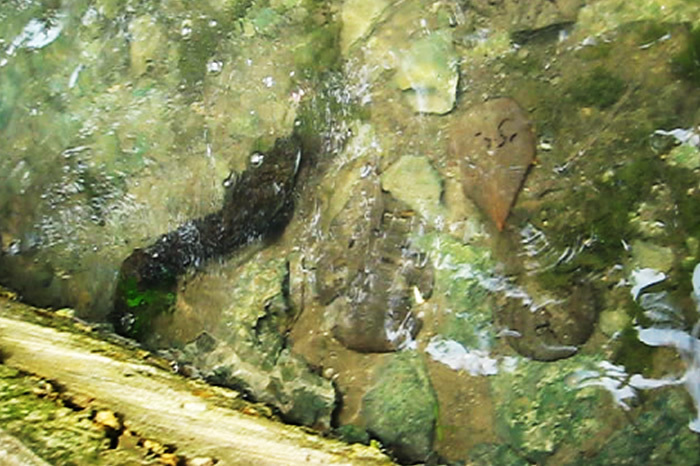 KAUNDANG SPRING – One of the famous water spring site in Brgy. Sta. Cruz, , Kaudang Spring offers an interesting view of the spring surrounded by wild plants and spring eels that maintains the availability of the source of water in the area. STA CRUZ FIESTA CELEBRATION – Celebrated every May 2-3, this is another Anda’s May fiesta gathering that everyone should not miss. Feast your way through the warmth and accommodating residents and relish the delectable hearty local cuisine. You’ll never go hungry in this barangay plus exciting pinoy games, grand discos, nightly shows and among others that would surely make you jam-packed with fun and excitement. KASADYA SA PASKO – A yuletide celebration in Sta. Cruz fills the air of excitement for the birth of our Lord. Carolling from different ends, glittering Christmas lights, homes which are gaily decorated for the season and Christmas presentation takes place. This barangay has so many bamboos sprouted in various areas. Thus, making them as one of the major producers of the finest “Amakan” in town. These are flattened clums of the bamboo (Tamboo) and woven that are being used for the construction of native houses, cottages, others.